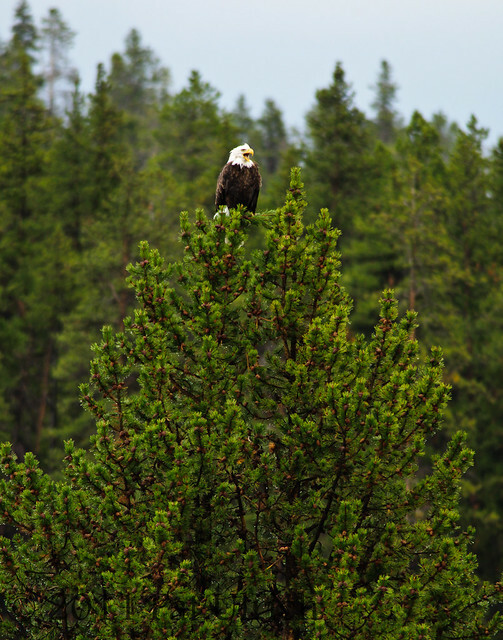 I've yet photographed a Bald Eagle. On this last road trip I got a Golden Eagle and that was exciting. I may try to put it on World Bird Wednesday if I can fix up the pictures some. Great birds they all are. Beautiful shot Pat of a spectacular bird. Boom & Gary of the Vermilon River, Canada. Perfect shot of an Eagle! He looks masterful surveying the countryside (looking for prey) from on top of that evergreen. Always next time is my mantra when we miss something on our travels! 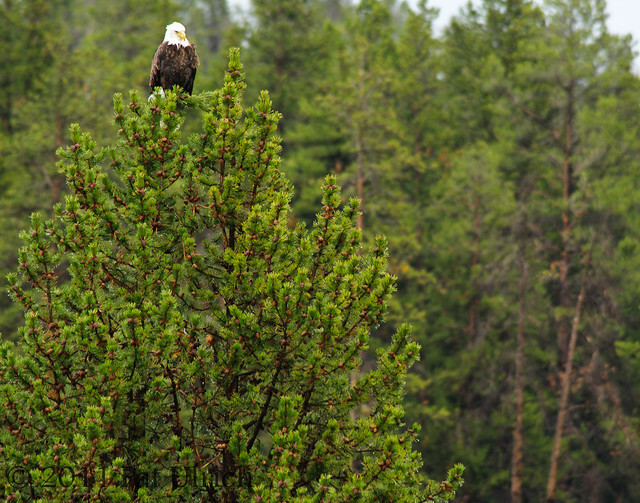 Great photo of the eagle sitting on the tree top. It must have been very interesting to see a smaller hawk scare it off. Beautiful eagle shots! They are awesome birds to see! I have been enjoying your "large terrestrial megafauna" very much but I must confess to missing your shore birds especially. That's what your awesome galleries are for! Love the eagle and the tree! Beautiful shots! He looks very regal sitting at the top of the tree. Great photos! How amazing to get to see this beautiful bird in real. Wonderful photos of this gorgeous bird, Pat! Hi there - what a splendid bird - yet to get any good pictures of Wedge-Tailed Eagles here in Australia - will keep trying! It must have been awesome to watch the RT Hawk chase the Eagle off. Great shots!